for family and friends using recycled items and things you have on hand? 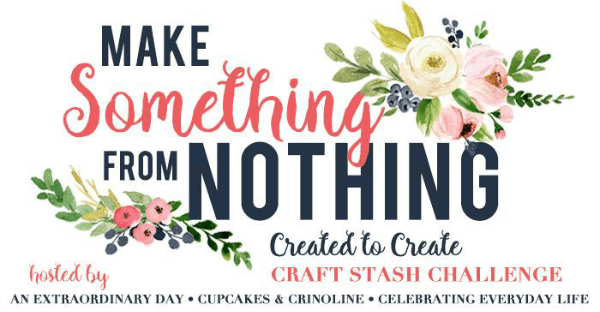 This edition of Make Something from Nothing is all about Valentine’s Day Gifts! 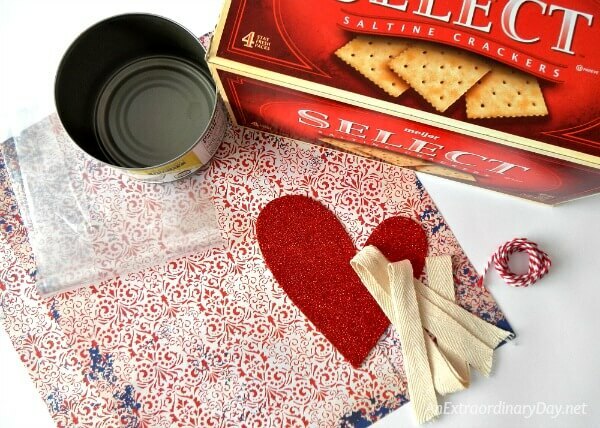 Who knew recycled tuna cans and cardboard saltine cracker boxes would help make these adorable and delicious gifts you’ll LOVE to give? Be sure to stay until the end to see the creative gift ideas my friends, Jennifer and Mary Beth are sharing this month too. What’s your love language ? Is it receiving gifts, words of affirmation, acts of service, quality time, or physical touch? I have a good friend whose love language is receiving gifts. You know because not only does she feel very loved when she receives a gift, she loves to give gifts. If you have people in your life whose love language includes gifts, find excuses to give them gifts and help them know they are loved. I think that it’s especially fun to give Valentine’s Day gifts to friends who probably won’t receive something on this special day. Food gifts are always a hit! And since chocolate is a favorite for Valentine’s Day, I thought that I would put a new twist on my popular banana bread recipe. My husband absolutely LOVES it! It is such a delicious dessert bread, that he made it into a triple chocolate dessert by topping his chocolate cherry nut slices with chocolate ice cream. YUM! If you’d like to make your dessert bread in a round shape, like mine... just collect a few extra tuna cans. What makes that extra special, is that you can get four or more “loaves” of this delicious dessert from one recipe. That means four or five gifts to give! That’s making something special from nothing for sure! Melt butter in small saucepan on low. Drain and slice cherries in half and set aside for later. In a separate bowl mix the flour, cocoa powder, soda, and salt together well, and set aside. Slice the three bananas into a large bowl and use a pastry blender to smash them well. Beat in the eggs, vanilla, and sugar. Slowly add the melted butter and blend into the banana sugar mixture. Slowly mix the flour mixture into the wet mixture until well incorporated. Do not over mix. Fold in chocolate chips, cherries, and nuts. Using your 3/4 Cup measuring cup to fill your buttered tuna pans. Place filled tuna pans on a baking sheet and bake in the oven for 42 minutes. Check a few minutes early if your oven runs warm. If your bananas are quite large, it may take another five minutes or so. It’s done when a toothpick inserted in the crack in the top comes out clean. Let rest in the pans for 10 minutes, then slip out of pans and cool on a wire rack. OR… Slip into cellophane bags and tie with bakers string for a lovely gift. I always say that presentation is EVERYTHING. Sure… giving a delicious chocolate dessert bread in a cellophane bag is not only perfectly acceptable… it’s quite lovely. And the dessert bread… Oh, my! But, if you have a little time, and want to make the gift extra special… slip it into a beautiful open-top gift box that YOU created. Since this is a Make Something from Nothing challenge… I used what I had on hand to make this sweet gift box… a saltine cracker box and some leftovers from my little craft stash. The saltine cracker box is the perfect size for holding bread baked in a large tuna can. Yay! Carefully release the glued end tabs of the cracker box so it will lay flat. Using a ruler and marker, draw a cutting line. Using a cutter (with a board or cutting mat under your box) cut along the line. Reglue the tabs to secure your box and allow to dry. Measure the depth of your box and double that amount for your paper and draw a line with a pencil for cutting. I prepared and cut my paper at 6 inches so that I would have 1/3 of an inch of paper wrapping under the bottom of the box and a little more than 2 inches of paper lining the interior of the box for a nice finished look. NOTE: If you wish you can cover the inside of the box with paper. Just adjust your measurement accordingly. Repeat the step above for your second sheet of paper. Two were required for this box as I was using 12″x12″ decorative paper. Starting with the edge of the paper on a corner of the box, fold your paper around the box and crease the paper so that your corners are nice and crisp. Apply Modge Podge to the paper (with a wide paint brush) to be adhered to the outside of the box — one side at a time. Don’t apply glue, yet, to the portion of the paper that will be folded to the inside of the box. Cut the corners of the paper on the folds to create the flaps for folding over the bottom edge and folding to the inside of the box. Apply glue to the flaps, one side at a time, and fold the paper flap over and adhere to bottom or inside of your box. Repeat with another sheet of paper. NOTE: The second sheet of paper will not need to be as long as the first to go around and cover the box. Trim it near the corner for a nice finished look. Now you have a beautiful gift box. Embellish your box as you wish. I added some twill ribbon my friend gave me that came around some towels she purchased. More recycling! The heart was from a package of hearts that I had purchased for other projects at the dollars store. Drop your delicious homemade chocolate dessert bread, wrapped in cellophane, into your Valentine gift box. Tada! You have an amazingly thoughtful, handcrafted, chocolate Valentine’s Day gift package. If you don’t have cracker boxes or tuna tins in your recycling bin already, then whip up tuna salad for lunches and a tuna casserole for dinner. Your family will wonder about the tuna craze… you can keep them wondering or get them in on the action, too. Since crackers come in little sleeves, don’t hesitate to rob a box or two from your pantry. Mary Beth, from Cupcakes and Crinoline, shares a super cute You Warm My Heart – Heart Shaped Hand Warmer AND… Jennifer, from Celebrating Everyday Life, shares a sweet Vintage Style Paper Heart Lampshade Mobile. Next month our theme will be Easter Table Top Decor Ideas. It will be an exciting adventure, thinking outside the box, to organize and decorate our homes with what’s leftover and maybe even considered trash. Who knows what we’ll create. Whatever it is… we’re going to have fun sharing how to Make Something From Nothing. I hope you’ll plan to join us each month! Oh, Diane! 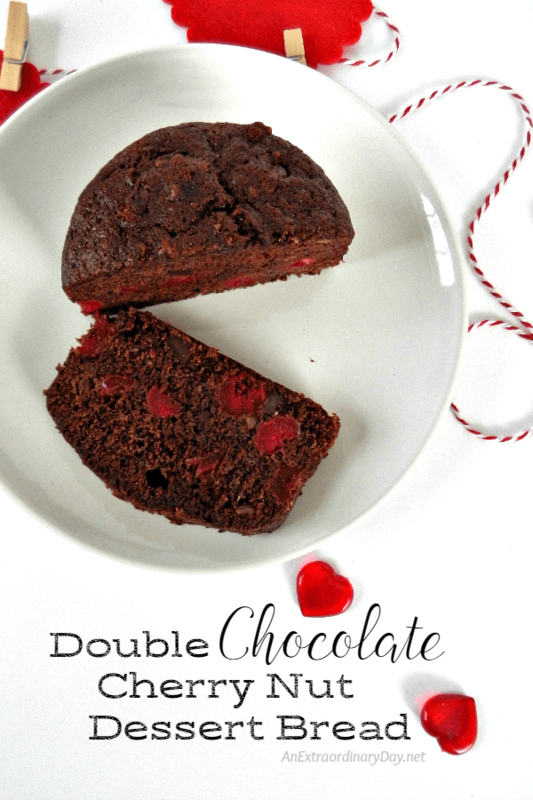 That double chocolate cherry nut bread looks so moist and delicious (now, I’m hungry!) and your gift box is absolutely perfect. You are so talented dear friend. As if the box wasn’t pretty enough you had to go and make a yummy cake to put in it and make me drool all over the computer. The packaging is adorable. What a thoughtful gift! Love it and thanks for the recipe. Its a great post.